I hooked up my new Honeywell Programmable Thermostat today and it was surprisingly easy. Honeywell includes a great set of instructions that was easy to follow. Note: Follow all the instructions that were included with your thermostat. These instructions are only a summary. Step 1: Before you start, make sure to turn off the power to your heating and cooling system. Step 2: Next, you need to get the old thermostat off. Ours had two screws securing the faceplate and two more screws anchoring it to the wall. I saved these screws and was able to reuse the same drywall anchors. Step 3: Honeywell included some small stickers to label all the wires. Tag each wire with it’s corresponding terminal. You might notice that some wires are not connected. This is common because thermostat wiring comes in different varieties and the wiring depends on your type of HVAC system. The instructions will help you identify the right wires. Step 4: Attach the new thermostat wallplate and feed the wires through the opening in the back. Step 5: Now it’s time to connect the wires to the programmable thermostat. Match up the tags with the correct terminals. Loosen the terminal screws and insert the wires. Tighten the terminal screws and make sure the wire is secure. I’ve relabeled the terminals so you can see them better. Notice that conventional HVAC systems differ from heat pump systems, but a programmable thermostat will work with both. Green – This is connected to the G terminal. This controls the furnace fan. Yellow – This is connected to the Y terminal and this controls the compressor for the air conditioning. White – This is connected to the W terminal and controls the heat. Red – Lastly, this is connected to the R terminal and mine is jumpered to the RC terminal. This is the source hot wire from the transformer. Step 6: Insert any required batteries and snap the programmable thermostat onto the wallplate. Turn the power back on and start programming your temperatures. If you’re in the market for a new thermostat, we like this 7-Day Touchscreen Programmable Thermostat from Honeywell, available from Home Depot at that link. That’s the model we installed here, and as you can see, Honeywell really made the install easy. What do you think? Ever install a thermostat? My house has all the wires White, Red, Yellow, Green and I also have a blue wire. where do I plug in that one? any idea? My heating and colling unit is old and the wirers aren’t the same color as the one in the instructions. How can I tell which ones are which? 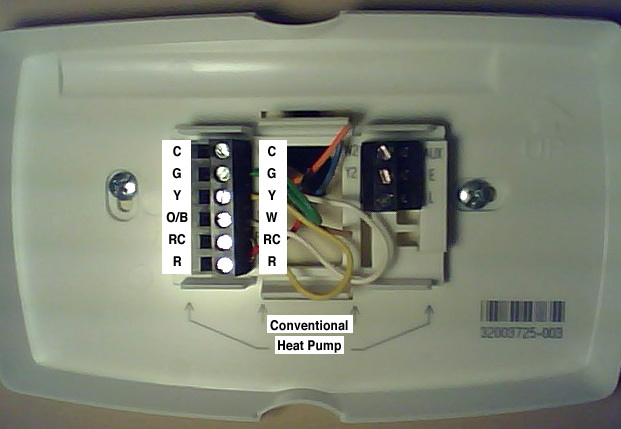 @Shenequa, are the wire terminations labeled on your old thermostat? If so, use them to identify the wires. If not, it may be time to call a professional. I only have two wires coming out of the wall. Can I still install a programmable? I just installed the Honeywell Programmable RTH7600D thermostat as a replacement for my old Sears Thrif-T. Installation went fine, and it seems to work. Maybe I’m reading the propoganda wrong. But the display is only illuminated IF I am touching the screen and changing the settings. I have to touch a control on the touch-screen before the display lights up. Otherwise it’s just a dark screen. Is this right? Is there a way to have the display lit and visible at all times? I bought the Honeywell RTH221 thermostat but I only have 2 wires coming from the wall, one is White the other one is blue. Now the system works fine but it won’t stop running when turning the temperature down. Please help!! I also have the same problem as Oscar, except I have one red and one white wire. The heater won’t turn off even after turning the temperature way down. Please help!! I bought the HoneyWell RTH221 thermostat, but I have only 2 wires (white &black) coming from my wall. How to install it where to plug the black wire ? I’m sure you’ve already solved your issues but I will post my experience for anyone else. I had the same issue where with a 2 wire system it would just run and run. The issue on mine was someone had switched a little switch on the back to set it for a single stage heat pump. I switched it back to standard (std) and it worked. These instructions look like they’d save the average homeowner some bucks. Thanks for this site! I’m so glad these are now common enough that when I bought my place it came with one already installed. The new smart thermostats (the ones with motion sensors, etc) look pretty cool. Any opinions out there on those?